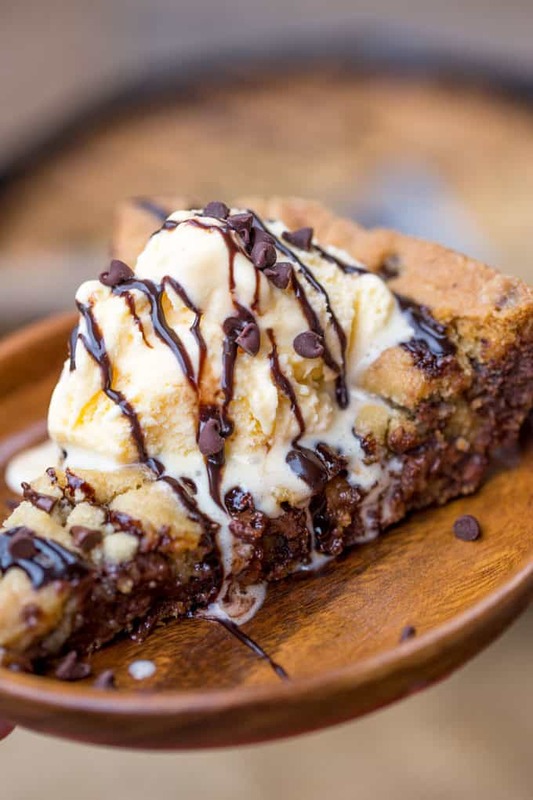 Chocolate Chip Cookie Pizza with mountains of warm melted chocolate chips and cookie dough baked in a deep dish cast iron skillet and topped with ice cream and chocolate. Fresh baked cookies may be the perfect dessert and this cookie pizza takes cookies to the next level. If you love this pizookie you’ll love these cookies on the site including Peanut Butter Blossoms, Turtle Cookies and Hershey’s Kiss Cookies. 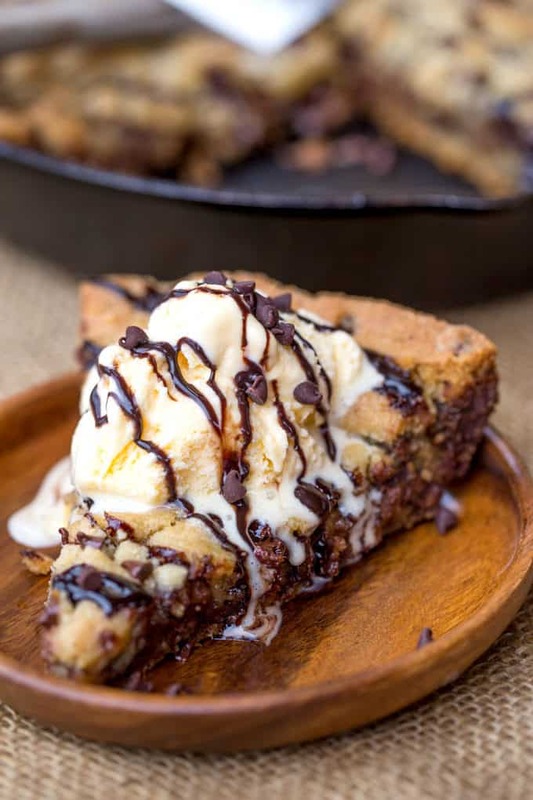 Chocolate Chip Pizookie may sound like a made up name but the concept of pizza shaped deep dish skillet cookies should make you and your guests smile with excitement as soon as you see the skillet come out of the oven golden brown. The perfect deep dish cookie pizza to help you and your friends with your game day celebrations. 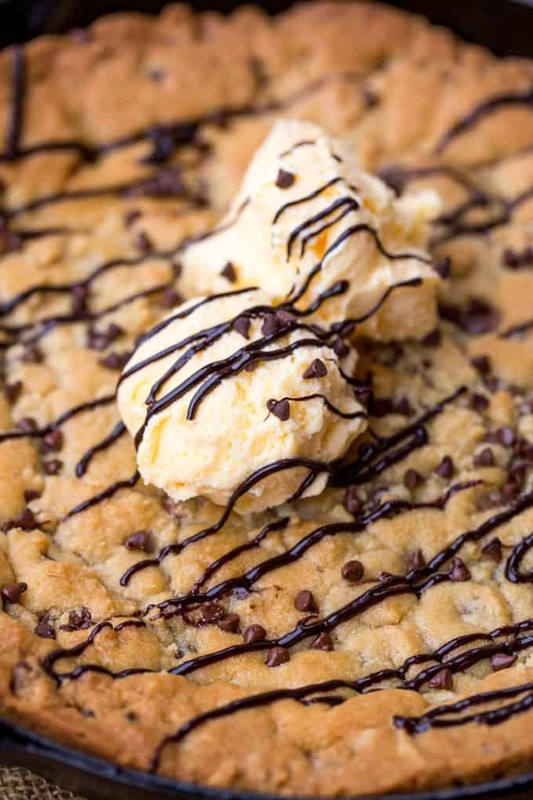 Then we top it with ice cream, whipped cream and hot fudge sauce to take a giant chocolate chip cookie recipe to the next level. The idea of the giant cookie pizza comes from a restaurant called BJ’s Brewery and the name is also bj’s restaurants idea, this is officially the BJ’s Pizookie Copycat recipe and I’m happy to say even though we aren’t near one of their restaurants anymore it totally fits the copycat role and if you order it when you go to BJ’s you will love it. This cookie is crispy on the outside, fully cooked yet still molten on the inside and with a scoop of ice cream you will not regret the extra cooking time you waited instead of just baking a batch of normal cookies. The idea being this Chocolate Caramel Pizookie is that it’s basically like a molten cookie for a crowd. By using a cast iron skillet you also retain a lot of the heat when it comes out of the oven so even if your crowd finishes eating pizza at different times the Chocolate Caramel Pizookie will stay perfectly warm (just keep it covered with a piece of foil) for 15-20 minutes. Cookie Dough: If you like the unbaked chocolate chip cookie dough flavor, cook for 20 minutes uncovered. The outside will be crisp and the inside will be undercooked like a warm chocolate sauce. 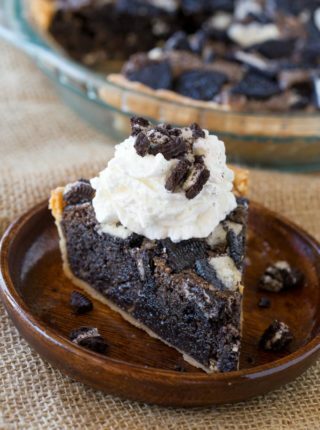 Chocolate Chunk: Add 4 kinds of chocolate chips including white chocolate, milk chocolate, semi-sweet chocolate and dark chocolate to make this pizza cookie the ultimate chocolate experience. Chocolate Peanut: Add a layer of peanut butter to the middle of the cookie dough. 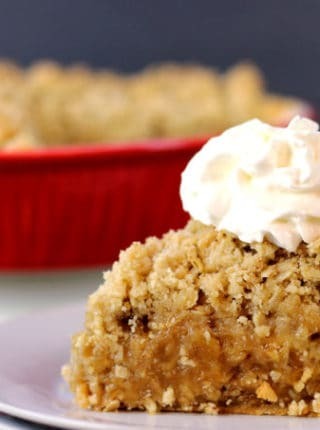 Or, add 1/2 cup peanut butter and about 1/4 cup powdered sugar together and add that to the middle so it tastes like the filling of a Reese’s peanut butter cup. Chocolate Caramel: If you want to pump up the caramel filling get 2 cups of caramels and a couple of tablespoons of heavy cream and melt them in the microwave together. Then put half the cookie dough on the bottom layer, pour over the cooled caramel sauce and the rest of the cookie dough. Refrigerate again until you need to bake and the caramel layer will stay in the middle as long as you sealed all around the poured caramel. Experiment with different flavors. Want to pump up the holiday flavors? Add in some chocolate with mint filling and top with crushed candy canes for a peppermint take on this Chocolate Caramel Pizookie. 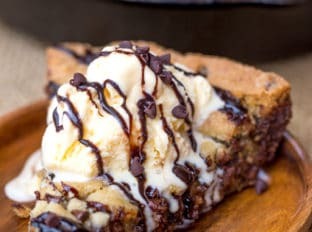 A Chocolate Caramel Pizookie with a dash of sea salt is a delicious giant deep dish cookie pizza just asking to be covered in ice cream and melted chocolate much to the delight of your loved ones! Preheat the oven to 350 degrees and spray a 10" cast iron skillet with baking spray. 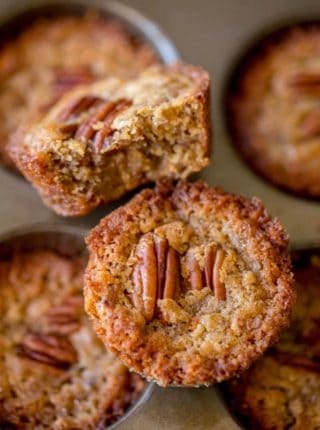 Cream the butter, sugar and brown sugar on high in your stand mixer until pale and fluffy (2-3 minutes). Add in the vanilla and eggs and combine on medium speed until fully incorporated. Add in the flour, baking soda, salt until just combined then fold in the chocolates. Put half the cookie dough into your cast iron skillet, sprinkle in the chocolate covered caramels then cover with the rest of the cookie dough and bake for 20 minutes, covered with foil, then uncover and bake for an additional 10 minutes. This post is sponsored by Nestle. One of my favorites! I would rather have one of these on my birthday than cake! Yes! I’m supposed to bring a dessert for a new year’s eve party we’re going to (just a small gathering), and I think this will be perfect to bring. Thanks for the recipe. 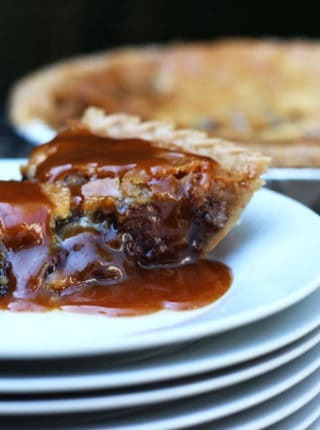 I just love this flavor combo — chocolate plus caramel equals yum! This looks incredible, and so simple to make. I love how you shared ways to customize the recipe to our liking. Thank you! I love being able to change it up!